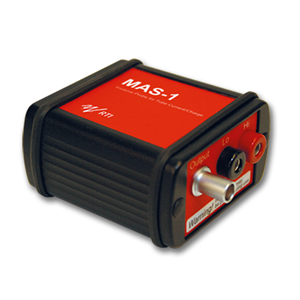 The MAS-1 Probe is an invasive probe for the measurement of mA (tube current) and mAs. Together with Piranha direct reading of mA and mAs as well as waveform are obtained. The MAS-1 Probe connects to the mAs socket of the X-ray generator and to the multimeter. The MAS-1 Probe can be used to measure tube current for both fluoroscopic and radiographic exposures. The probe has a built-in low-pass filter with user-selectable bandwidth of 5 or 500 Hz and accepts a floating input range of ±90 V relative to ground. The MAS-1 Probe supports our automatic detector identification system. When connected, the Piranha or Cobia automatically identifies the probe and makes all necessary adjustments without any need for interaction from the user. The system also gives full interchangeability of probes between different Piranha systems or Cobia systems, using the same type of probes.